New horror/comedy from award-winning writer/director Gregory Blair gains a spot in the prestigious bi-coastal festival. 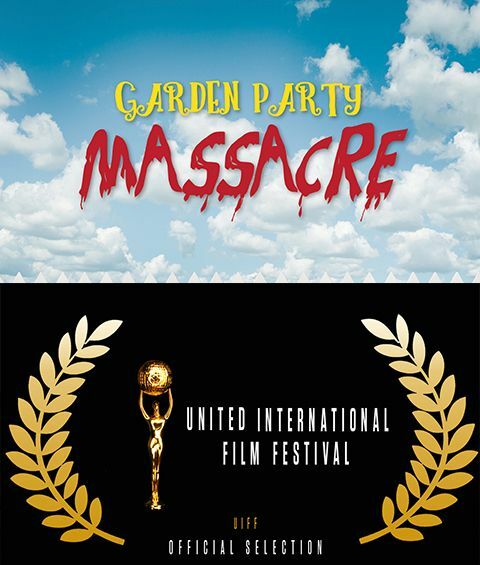 HOLLYWOOD, Calif. - Aug. 24, 2017 - PRLog -- Award-winning writer/director Gregory Blair's latest film--horror/comedy GARDEN PARTY MASSACRE—has been announced as an official selection of the United International Film Festival—a bicoastal festival, taking place both in Hollywood, California and in New York City. The United International Film Festival showcases films from across the globe and features industry networking events, red-carpet galas, special screenings and award ceremonies. The festival's mission is to advance the work of independent artists in film and to share their stories with the world; they believe fresh perspectives from visionary storytellers are essential for a healthy and vibrant society. "I'm honored to be a part of this empowering festival," Blair said. "I love their perspective on the impact and import of film and its potential to touch lives and effect change. While a silly comedy like GARDEN PARTY MASSACRE may seem an odd choice at first glance, I believe that humor is vital to balancing out the real horrors of our world and that communal laughter is a unifying balm that heals. In that light, I think the higher purpose of the film fits perfectly with the festival's philosophies." The film--Blair's follow-up to his much-lauded DEADLY REVISIONS--is a fast-paced, wacky spoof in the vein of Shaun of the Dead and Tucker and Dale vs. Evil. The story revolves around a friendly backyard gathering that goes hilariously awry when an unexpected guest arrives. With a pickaxe. And an attitude. It's a screwball brew of murder, mirth and mayhem that critics have hailed "Hilarious! ", "Brilliant!" and "A Comedic Romp!" (Search My Trash Filmsite, The Movie Sleuth and Geek Nerdery, respectively).